Background: Hydrogen is a clean, versatile fuel and energy carrier which can be produced by a range of renewable technologies for combustion, use in fuel cells, or as a manufacturing feedstock. Despite its attraction and significant technological innovation, commercial feasibility of photobiological hydrogen processes is far from demonstrated. Objective: This review examines direct photobiological biohydrogen systems, with a particular focus on the main obstacles that must be overcome to deliver commercially viable, net energy positive systems. As part of this process the interactions between future photobiological biohydrogen systems and other parts of a renewable energy economy are examined to analyse potential technology integration paths. Results: The primary driver for renewably produced hydrogen is the potential for CO2 emissions reductions. Renewable hydrogen is largely solar driven, either directly (e.g. natural photosynthesis, or bio-inspired devices) or indirectly (e.g. fermentation, electrical hydrolysis). A large market for hydrogen already exists and is supported by extensive infrastructure providing significant opportunities for emerging renewable hydrogen streams. 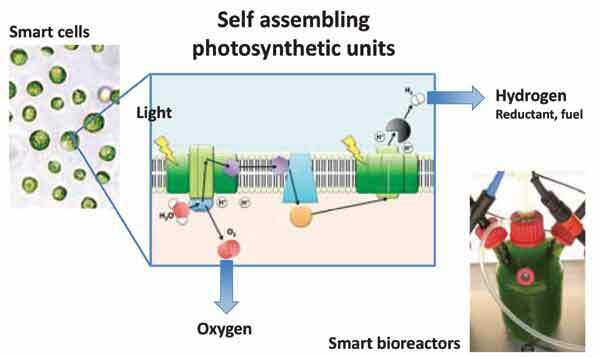 Several key physiological obstacles to efficient photobiohydrogen production have already been overcome, with oxygen tolerance as the most significant remaining problem. Conclusion: A much deeper understanding of photosynthetic biology is required before existing knowledge can be integrated with real world systems. Cross-fertilisation between engineering and biology represents the best path forward for implementation as a robust biotechnology. Photosynthesis, Photosystem, electron transport, hydrogen, hydrogenase, oxygen, renewable energy, EROEI. Institute for Molecular Bioscience, The University of Queensland, 306 Carmody Rd, St Lucia, Queensland Australia.